The overall aim of Lions International is "To empower volunteers to Serve their communities, meet humanitarian needs, encourage peace, and promote international understanding through Lions Clubs". The Lions Club of Basingstoke was founded in 1967. Since then it has raised over £500,000 of which around 90% has been spent to support our local community. "Activities Make the Club". That is a direct quote from from a 1927 newspaper article by International President Irving Camp. It is as true now as it was then. Being a member of the Basingstoke Lions Club is about enjoying yourself working voluntarily with others. If you like to muck in and do things this is the place for you. Physical and mental challenges abound. During the course of a normal Lions year you can be a furniture remover, a table decorator, a barman, a scorer, a quizmaster, a route steward, a stall holder, a compere, a tinshaker, a public relations officer, a website manager etc. etc. You can also give yourself an attack of claustrophobia by donning the Lenny suit. It doesn't matter what it is, you just get involved and it all becomes easy. And, as you do things you develop confidence in your own abilities and skills. And then, if you have delusions of grandeur, you can always become President, Treasurer, Secretary or a Committee Chairman. But beware - irreverence is the watchword at our Business Meetings. To make sure that the members hilarious misconduct is kept within bounds, we have a Tailtwister whose duty is to fine you for any and all offences. The worst offence is failure to offend or participate! Partners are welcome at all events. We hold monthly dinner meetings at which we play Russian Roulette with our digestive systems by frequenting a variety of local eateries. We have a Christmas dinner, a Charter Night, a Handover party (sort of hierarchical musical chairs) and an annual get together with the Lions Club of Alençon at which a boules trophy is hotly contested. We have all this fun together while raising money to help our local community and to help Lions International disaster relief and medical projects. So what are you waiting for? Give us a go. We are non political, non sectarian and have members of both sexes. See Join Us where you can learn about membership and see some of the causes we have supported over the years. Click the Meet the Members sidebar on this page to get an idea of what we're really like. We raise funds by organising events and activities which we hope people will enjoy. We are always on the lookout for good fundraising ideas. What we raise for charity goes to charity. (See our Events Calendar and Upcoming Events pages). Funds raised go into a Charity Account. From this support is offered to individuals with difficulties or to organisations that help people and which themselves need financial or practical help. (See our Welfare Page). Message in a Bottle is a particularly valuable service which we provide. We are constantly looking for ways to encourage people to come forward and see what we do. Take a look at our Club News Page where you'll find copies of our monthly newsletters and reports on the outcome of our fundraising events. We also try to encourage and acknowledge young people who serve their communities and those in need of assistance. 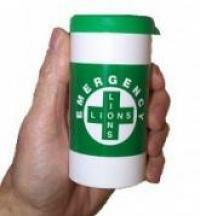 See the Lions Young Ambassador button on this page. But ours is only one of over 46000 clubs working in countries all over the world with more than 1.35 million members. Each is an autonomous unit which works in its own particular way to meet the needs of its community. But all work to the same purposes and ethics, and under the aegis of Lions International. Lions International was founded in 1917 by Melvin Jones, a Chicago businessman. At that time, apart from community service, its main concerns were sight, hearing and speech conservation, diabetes awareness, education and environmental issues. It is now the largest service organisation in the world. It works closely with the United Nations on disaster relief, health screening and immunisation programmes where local Clubs are on hand to play a part. Take a look at the Lions International page for some of the programmes that are currently being supported.